The Crying Boy Picture added to The Creepy Corner! Eventually, some of these paintings were brought to England, mass produced and sold in shopa and department stores at a cheap price. More than 50,000 copies of the paintings made their way into people’s houses all across England. The stories of the fires began to smoulder, and the series of events relegated to the status of legend. However, the question still is ‘If the paintings were indeed somehow causing or enabling fires to take place, what force could be behind it? There are several stories behind the legend of the painting itself. 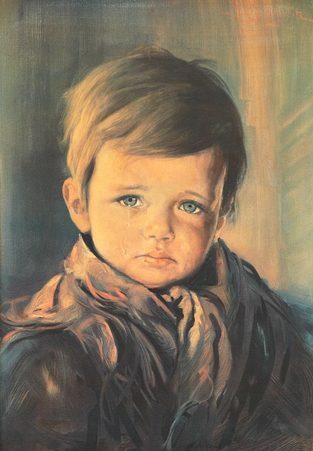 One states that the models for the various crying boys were orphans who, soon after the paintings were completed, died in a orphanage fire. Unfortunately, all of the facts of this story can not be 100% confirmed. Bruno Amadio, the painter, died in 1981, the truth of this story has also gone with him. Can a graveyard be Haunted? Wow! Another great article. I love your blog and the articles you share.